Ahead of the 2019 general elections, the Federal High Court, on Monday, barred its judges across the federation from granting ex-parte orders in any political case that is brought before the court. It equally directed that all pending political cases that could affect the opportunity of candidates to pursue their political ambitions, should be concluded before the end of next month. Chief Judge of the High Court, Justice Abdul Abdu-Karafati, who gave the directives during a special session the Court held to mark the commencement of its 2018/2019 Legal Year, said the decisions were aimed “to forestall any hiccups and the blame of the court by the political gladiators”. He said a circular had already been issued to Judges, to the effect “that interim orders ex parte shall not be granted in any political cases brought before the court”. According to the CJ, “I believe that controversies especially in political cases can be reduced when the court takes a decision after hearing all the parties in the case. “It is also extremely important that all political cases that may affect any of the parties which are still pending in any of our courts be concluded without further waste of time to afford all candidates the opportunity to pursue their political ambitions. “Hon Judges before whom such cases are still pending must endeavour to conclude them before the end of October, 2018. “I urge your Lordships to be wary in handling all cases and especially cases concerning political parties and the upcoming general elections. We should again use this court and the constitution to regulate our society for the good of our children and mankind. “I still believe that the judiciary remains the hope of all people whether common or uncommon. “It is therefore your duty to ensure that the society is moulded in accordance with the rule of law and the constitution. You must therefore administer justice without fear or favour”, he added. 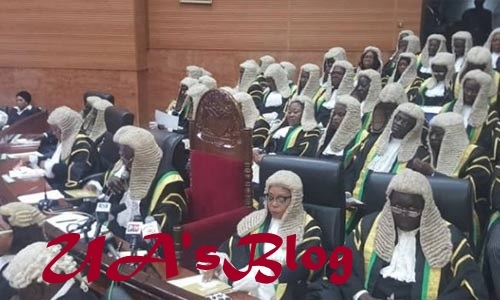 The High Court flagged-off its new legal year, on a day the Chief Justice of Nigeria, CJN, Justice Walter Onnoghen, vowed to prosecute any judicial officer found complicit in the leakage of judgments to litigants. The CJN who spoke at the opening ceremony of the 2018 National Workshop for Secretaries, Registrars, Court Clerks, Protocol Officers, Bailiffs and other Administrative Staff of the Judiciary, organised by the National Judicial Institute, NJI, said there was need to preserve the integrity and independence of the courts. He said it was imperative that court records and exhibits were properly managed. “You must avoid temptation of leaking judgments for any consideration that will compromise your duties and bring the judiciary to ridicule”, the CJN warned judicial officers. Meantime, the Attorney General of the Federation and Minister of Justice, Mr. Abubakar Malami, SAN, urged the judiciary to remain neutral and impartial in the face of litigations that would trail the 2019 general election. Malami, whose speech was read at the FHC new legal year event by the Solicitor General of the Federation, Mr. Dayo Apata, said the judiciary must always strike the appropriate balance between the personal rights of litigants and the overall good of society”. He said: “Today, our country faces serious political and constitutional challenges from different sectors, particularly due to the on-set of political activities towards the 2019 General Elections. “In view of its unique role as the arbiter of most legal disputes involving the Federal Government and its agencies, there is no doubt that this Court will be increasingly required, in the next few months, to adjudicate on serious matters affecting the legal aspects of national issues. “I trust that in this endeavour, you shall continue to dispense justice in a fair, impartial and courageous manner, as you have done over the years. “In light of the crucial constitutional mandate of this Court and I urge the Court to take urgent steps to facilitate the speedy dispensation of justice and engender greater public respect and confidence in the Court. “In undertaking the above, permit me to suggest that our Judges must always strike the appropriate balance between the personal rights of litigants and the overall good of society, both of which can mutually co-exist. “In this manner, the Judiciary will play its role actively as an agent of social change and re-orien’tation without necessarily sacrificing its ‘core mandate of protecting the rights of all individuals and institutions in an efficient and humane manner. “Let me also appeal that Judicial officers must equally ensure that the credibility of their offices and their sense of personal integrity remain unimpeachable at all times in order to promote greater confidence of the public in the judical system”. Similarly, the Nigerian Bar Association, NBA, represented by its President, Mr. Paul Usoro, SAN, decried what it termed as “rule of law degradation” in the country, saying there was need for the judiciary to maintain “eternal vigilace at all times”. NBA also implored Judges not to allow themselves and their courts to be dragged into “these murky waters of politics and in the process embarrass the Justice sub-sector”. “Beyond the pre and post-election matters, we have historically been faced with constant assaults against the rule of law and the 2018/2019 Legal Year will not be an exception”, the NBA warned. “As we go into another season of elections with its attendant contentions and cases, we respectfully urge Your Lordships to always keep in mind the weighty responsibilities that rests on Your Lordships’ shoulders to continually save us from ourselves through Your Lordships’ pronouncements, and in the process which, in no small measure, assists in maintaining the peace, unifying and welding us together as one nation”, the legal body added.